For the past four years, along with my erstwhile co-teacher Meara Christopher and for two of those years, our Youth Programs Coordinator Libby McDonald, I have taught the Coming of Age class. This is a school semester-long course designed to serve like Confirmation in the Catholic Church, or a Bat/Bar Mitzvah in the Jewish faith. Each year in the spring, our out-going Unitarian Universalist 8th graders do an intensive study in… themselves. We discuss values, beliefs and morals. There are an in-depth discussions regarding Unitarian Universalist Principles and Sources, considering each in light of the individual youths’ interpretations. We play games together, including a confidence-building physical challenge, like a ropes course or rock climbing and The Game of Real Life. The youth examine themselves from inside-out to discover what spiritually illuminates them, and what will propel them in the UU community through their high school years. The keystone of this entire experience is the homily, or statement of belief, that the youths give on the final Sunday, during a service that they organize and lead for the entire congregation. Not only is this a vital experience for each youth, it is also a valuable service for the church community to be an active part of- in my opinion, it is the responsibility of each church member to attend this service in order to understand who the future of their faith is, and what they think about the Unitarian Universalist condition. 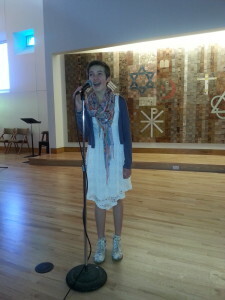 We had an outstanding speaker this year, an eighth grader named Emma Elliot- whose words you’ll be reading in a moment. Emma also sang a number at the Coming of Age service which brought down the house. Emma has been a member of our Mid-Hi class since she was a sixth grader; very active, always thoughtful and bright. She exemplifies the kind of youth that I believe light the future of our faith, provided we help them continue to shine by emphasizing milestone experiences in our RE programs. Coming of Age and High School Bridging are common experiences we celebrate by coming together as congregations. There should be more. We should celebrate, as a community, the end of Early Childhood and the entrance into Mid-High, then Coming of Age, then Bridging to Young Adulthood, sure, but what comes afterward? For some of us, graduation from college, entering the workforce, or becoming a parent. There really isn’t a Bridging ceremony for Young Adults to become, um, not-so-young adults in the congregation-at-large. Milestones become harder to pinpoint after one’s twenties, but they are still present and important to recognize and celebrate. At some point, one can be considered a church elder, but what point might that be? We need to recognize these moments, and monument them whenever possible. Hello! My name is Emma Elliot and I am an autodidact. I believe that everything is a miracle, not in the religious sense that most people use the definition, but the circumstances that allow us to breathe, have beating hearts, functioning brains. All of it dependent on the sun being just the right distance away and evolution having happened in such a specific way as to bring us all here to this moment. I believe that there is mystery and wonder to the universe. I do not believe in God. Purpose and meaning are not created by some god, it is up to each person to determine those things for themselves. Whatever you believe, you have to be prepared for the fact that you might be wrong. Christians believe in God and heaven and hell. Atheists may believe there is nothing, but we don’t know for certain. I am comfortable with this uncertainty. I love that it is all an unknowable mystery. Each religion has parts that are beautiful. They fill me with wonder. They make me curious, but I believe no one religion has the entire truth. I find joy in living in this miraculous moment. Rather than worry about a higher power or what happens after I die, I choose to stay present in this moment. If I enjoy it and do all I can to make sure others enjoy it, then it doesn’t matter if there is heaven or nothing because all that matters is this moment. I believe all people are unique. Uniqueness is what makes us special. My beliefs, talents and qualities are very different than any one else’s. There are people who think in similar ways, but no one else has my exact beliefs. There are people with whom I share qualities, but no one does things exactly like me.Yet, we live in a world where it is hard to be unique. That is why it is very important to be authentic. I am outgoing, accepting and friendly. I believe life is meant to be happy and that there can be enjoyment in almost everything. By being happy, there is also pleasure in making other people happy. I create a lot of meaning in life by making people happy and being happy myself. I want to enjoy this, as poet Mary Oliver calls it, “one wild and precious life.” I choose this as my purpose. To be authentic and work to bring joy to others requires a great deal of courage. Courage can be difficult for everyone. Courage is finding the strength to do what you think is impossible. You can’t be authentic or pursue your purpose without courage. Having courage doesn’t mean that you don’t fear things, it just means that you do what you need to do even though you are fearful. For example, I feel very strongly that everyone deserves the right to love whomever they love. Unfortunately, we live in a time when there is a great deal of hate and fear about people who are gay. In order to fight for the rights of everyone and to be authentic about feelings of love, it takes courage to stand up to those who disagree. Standing up for yourself and others takes risk. We should be taking more risks everyday. Without those risks, we would never mess up, and if we didn’t mess up then we would never learn. Everyone is unique. If we can be authentic, then our unique qualities will shine through. We can create our purpose using our own unique qualities. By determining our purpose and living with the courage to follow it, we create meaning. Authenticity leads to purpose; purpose leads to meaning and it all takes courage. I am going to enjoy exploring this beautiful and mysterious life… making mistakes, learning and growing, being true to myself, creating purpose and finding meaning. I hope you do, too. Emma Elliot is a proud member of First Unitarian Church of Albuquerque. She is 13 years old and has home-schooled her entire life. Emma is passionate about training with her beautiful 7 year old German Shepherd named Senex. She has a strong love for theatre and has performed in numerous shows with theaters in Albuquerque and Boston. She enjoys traveling and has been to more than 20 different countries and 49 of the 50 States. She loves exploring her passions and trying new things and wants to spend her life inspiring others to do the same. MB Tankersley started life as a Baptist, then kept moving left on the religious spectrum 'til he fell off & became UU in 1999. He is trained as a UU Youth Advisor, having undergone advanced-level UUA Youth Advisor training. Has worked extensively in this area, contributing to successful youth programs in Texas & New Mexico, at the local & district levels. When not UU-ing, he is a Little League Umpire, & works with advertising agencies across the country in Out of Home Media. I haven’t been at my current congregation long enough to see one, but what we called the “Credo Service” at my last church were some of my favorite services. Nothing says “Free Pulpit” like handing it over to a short string of 13 and 14 year olds. I almost always learned something.